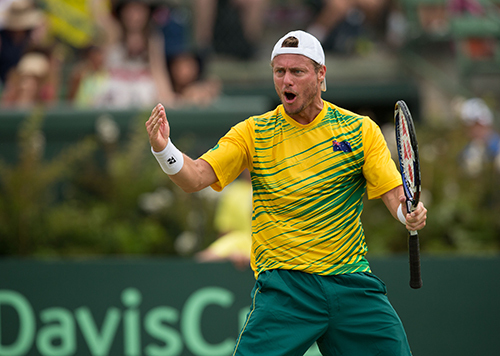 Despite retiring three years ago, Lleyton Hewitt just can’t keep his nose out of tennis with the soon-to-be 38-year-old set to play doubles this week on a wild card in New York at a minor ATP event. The Australian Davis Cup captain may also be glad to distance himself from the ongoing controversy at home, where he is a major player in a running feud with Aussie tennis maverick Bernard Tomic. The boilover erupted during the Australian Open, tainting the major for many local fans. Hewitt and Tomic have been exchanging public insults throughout, with event tennis Australian seemingly split on both sides of the controversy. With all that in the rearview mirror for the moment, Hewitt will likely be happy to take solace at the tournament on Long Island, where he has paired himself with one of his handful of young prodigies, Alexei Popyrin. Since a first-round loss last summer at Wimbledon with teenaged Alex Bolt, Hewitt has taken up a doubles spot in five tournament, including the last month’s Australian Opens, where he and John Patrick Smith lost in the first round. Hewitt’s original partner in the US was to have been shooting staar Alex de Minaur, Hewitt’s top pick for the future of Aussie tennis. But the Spanish-bred youngster came down with illness and pulled from the event, leaving Hewitt to scratch up another partner if he wanted to keep his place in a field where he will surely be among the biggest drawcards. Double grand Slam winner Hewitt and the 124th-ranked Popyrin will go in cold on Long Island and could face a tough ask in the first round against Robert Lindstedt and Tim Puetz.